Sir Christopher Lee has not received the credit for the sheer breath of his talent. He holds the Guinness World Record for the most screen credits of any actor, yet for most of his career he has been playing villains. However, WHAT VILLAINS he has played. For two or three generation of filmgoers, he has been in turn Dracula, Scaramanga from the James Bond film The Man With The Golden Gun, Saruman (from The Lord of the Rings), and Count Dooku (from the Star Wars prequels). What has aided him in portraying such monsters is both his imposing height of 6' 5" and that unmistakable voice. I think that because he has played so many we forget just how strong and good an actor Christopher Lee is. He has always talked that his favorite role was that of Pakistan's founder Muhammed Ali Jinnah in Jinnah. He is as far from a villain as one can get (despite the failure of Pakistan to be a true and functioning democracy like its neighbor and rival India). One at first would think a Muslem or at least a Pakistani would be best to play the part, but Lee's extraordinary range allows us to forgive the casting of the British Lee in the title role of the Father of Pakistan. As a side note, I would love to ask Lee what he thinks of how Pakistan appears to be falling apart and what Jinnah would have thought about all the misery the nation has endured since Partition, but I digress. Above all else, it is Lee's distinct and deep voice that sells both villainy and warmth. He exudes elegance as the Lord Summerisle, but with that comes a menace that makes The Wicker Man more frightening. However, we can't forget his small but important role in Hugo. Here, he might appear to be a scary person, but in reality he is a kind man who shares with the title character the importance of books. The range of his career can only be admired. Yes, he created iconic villains in brilliant films (and yes, not-so-brilliant films), but Lee is more than vampires and wizards. He is a man of culture, of intelligence, and of incredible range. How does one go from Jinnah to Saruman, from Scaramanga to Police Academy: Mission to Moscow (showing he is perfectly capable of being in on the joke), and not stand back and marvel at the wide variety of roles he has played? Christopher Lee is not just a brilliant bogeyman (although he is that). He is an actor to which few can stand toe-to-toe with (in many cases, literally). He is a truly great actor, and now that he is entering his twilight, perhaps he will get the long-overdue credit he deserves, perhaps an Honorary Oscar or a Kennedy Center Honor. 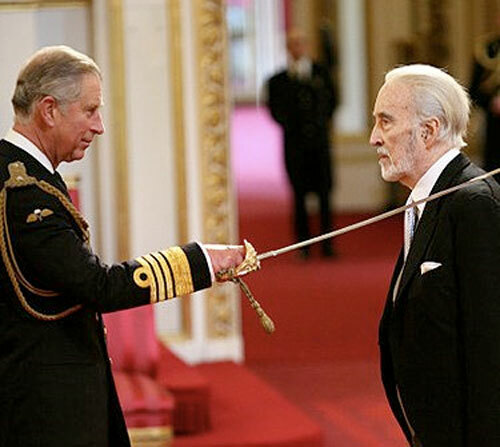 With that, I wish a Happy 90th Birthday to Sir Christopher Lee.